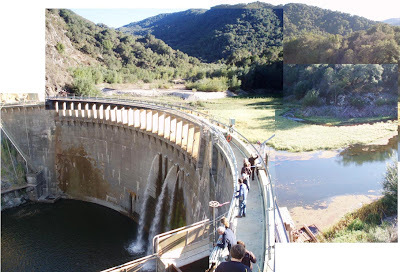 On Nov 5, 2008, the California Coastal Conservancy hosted a tour of the San Clemente Dam on the Carmel River near Monterey, CA. Planning is underway for the removal of this obsolete dam. Constructed in 1921, the structure has become a liability to its owner, CalAm Water, mainly due to sedimentation and structural instability. San Clemente dam is located just downstream of the confluence of the Carmel River and San Clemente Creek, and the majority of the accumulated sediment is located along the Carmel River. This is the view looking upstream: the sediment 'wedge' is clearly visible on the left, and San Clemente Creek is to the right. The Coastal Conservancy has taken the lead working with CalAm to investigate the potential for removing the dam. As with all dam removal projects, sediment management is the primary technical hurdle. In the case of San Clemente Dam, the geography provides an interesting opportunity to stabilize the 2.5 million cubic yards of sediment in place, and divert the river around the current reservoir. The proposed project would blast a new channel through the ridge separating the river from the creek, and divert the Carmel River into the creek approximately one-half mile upstream from the dam. The rock blasted from the bypass channel would be used to create a structure (the “diversion dike”) which would force the river into the diversion. 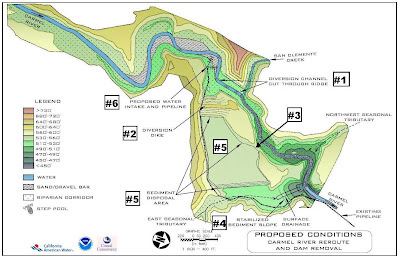 The bypassed portion of the Carmel River would be used as a sediment disposal site for the accumulated sediment. Sediment would be removed from behind the dam to the bypassed portion of the reservoir over one season by excavation with heavy earthmoving equipment. 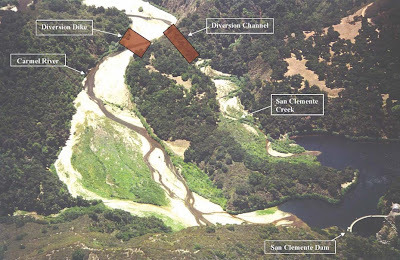 Approximately 380,000 cubic yards of sediment in the San Clemente Creek arm of the reservoir would be relocated to the Carmel River arm, where the bulk of accumulated sediment already has been deposited. The sediments at the downstream end of the bypassed reservoir arm would be stabilized and protected from erosion. The San Clemente Creek channel would be reconstructed through its historic inundation zone from the exit of the diversion channel to the dam site. CAW would pay an amount equivalent to the cost of buttressing the dam in place, which was estimated in 2005 as $49 million. The State and Federal government, through the leadership of the Conservancy and NOAA Fisheries, would secure the additional funds needed from State, Federal and private foundation sources.